My dear Alaskans, it’s going to get much worse. There’s a lot up for grabs in Alaska, and not a lot of voters to persuade. There are cities with more votes for mayor than Alaska has for top slots in Washington, D.C. The election process is already a few sump pumps short of a democracy — and sinking. The last hundred years or so the U.S. Supreme Court has systematically transferred to corporations the rights of actual citizens. You hear about how immigrants are coming to our shores and taking services and how we need to build a fence but you don’t hear remotely comparable bitching and moaning about foreign corporations coming here, getting subsidized, using resources and dodging taxes. Heck, they can kill American workers in industrial accidents without being considered foreign terrorists. Since the court seems nothing if not predictably misguided, I expect next they’ll decide corporations are entitled to impose their “religious beliefs” on their workers. The Hobby Lobby case will determine if a corporation can deny its employees health care benefits its owners don’t like — like birth control. The whole concept is wrong-headed. More rights for corporations and fewer rights for individual Americans, with no end in sight. Get ready to pledge allegiance to the United Corporations of America. 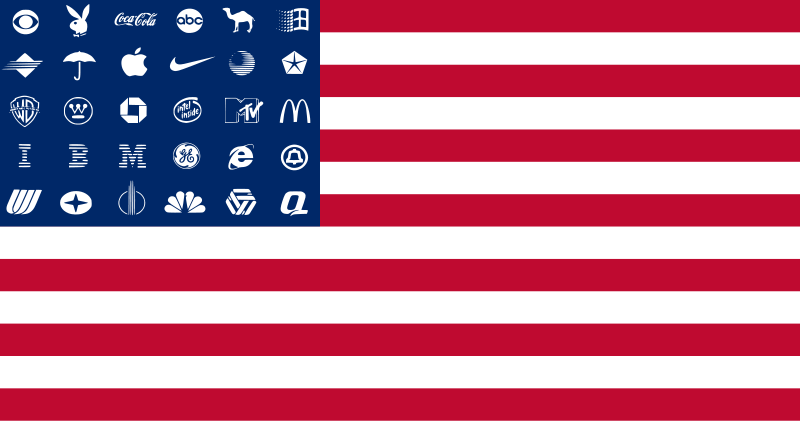 Picture a flag with 50 corporate logos instead of stars. No more voting hassles, just an endless public auction of politicians. As they say, the one with the gold rules. The part that really chaps me is we fought a revolutionary war as much to throw off the power of the East India Trading Company as to dump England’s royal parasites. You know, the original tea party. Sorry, T.J., we didn’t crush them. We feed and water them at the expense of the neediest among us, and our highest court scurries to hand them the inalienable rights that were supposed to belong to the people. Sorry, Abe, you had it right. Or maybe it’s worse than you feared. « Send me to Juneau! Well said Shannon. The McCutcheon ruling is a travesty. Between Citizens United, and this latest idiocy, the Teaparty Koch puppet masters can buy nearly any seat in a toss up state. Looks like you’ve been reading Justice Stevens’ 2010 dissent on the Citizens United v. FEC ruling. Well said.